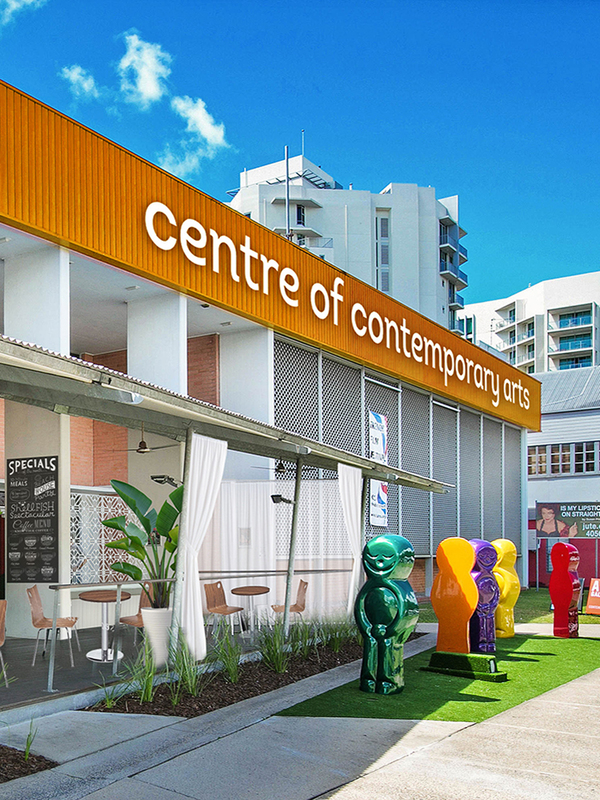 The Centre of Contemporary Arts Cairns (Home of the Giant Jelly Babies) at 96 Abbott Street is a significant piece of Queensland Government regional arts infrastructure consisting of The Theatre, a 241 seat black box theatre, The Space, a large open plan rehearsal and performance venue, two A Class galleries, meeting and workshop facilities , plus a cafe and theatre bar number 96. The CoCA Management team, known as Arts Cairns is Arts Queensland's direct representation in the north of the state, and was born from the amalgamation of the former Cairns Regional Office (CRO) and the Centre of Contemporary Arts Cairns (CoCA Cairns). Based at CoCA Cairns, the Arts Cairns team are responsible for Arts Queensland's program delivery and infrastructure management in Cairns and Far north Queensland. CoCA also home to resident AQ funded companies JUTE Theatre Company and KickArts Contemporary Arts, as well as partnering with End Credits Film Club to provide the ongoing contemporary cinema program, Unseen Cinema. There are two performance spaces within the centre, The Theatre and The Space. CoCA's free car park for visitors to the Centre is located behind the Centre and can be accessed via the driveway on the left of the building, as you exit the roundabout travelling southwards. There is also free car parking located in Abbott Street directly in front of CoCA and a public bus stop immediately out front.